Math. Just the word can make most homeschool moms shake in their boots. It has been the one subject that has had me considering public school on more than one occasion. It has been a struggle to find that perfect fit for us. We’ve tried it all — computer-driven, DVD-driven, workbooks, living math, everything that everyone has promised is THE math program that will cause Ben to love math. At this point, I don’t even care if he loves it, I just want him to do it without so much complaint that I want to pull my hair out. Math Mammoth has us well on our way. Math Mammoth offers all of their products in downloadable form and most in printed form. They have products for grades 1-8. The downloadable version PDFs are enabled for annotating. This means that the student can actually complete the PDF file on the computer, using the typewriter and drawing tools available in Acrobat Reader version 9 or higherm, or on a tablet device such as an iPad, using a PDF app that has annotating tools. Math Mammoth Light Blue Series: This is their full elementary math curriculum for grades 1-6. Each grade level consists of 2 worktexts (A and B), as well as supportive materials, such as answer keys, tests, cumulative reviews, and an additional worksheet maker. 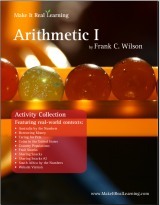 Math Mammoth Blue Series: These are worktexts (textbook and workbook combined) on specific topics. Topics include addition, subtraction, place value, clocks, money, measuring, multiplication, division, fractions, etc. Math Mammoth Golden Series: These are worksheets by grade and contain 120-150 worksheets per grade, for grades 3 through Algebra (grade 8 or 9). Math Mammoth Green Series: These are workbooks by topic. Topics include numbers/operations, addition/subtraction, multiplication/division, decimals/fractions, measuring, geometry, etc. Make It Real Learning: These workbooks contain problems or activities taken from real life situations. They show how math is useful! We chose to do workbooks from the Green Series so that we could use it alongside our usual math curriculum. I loved being able to print off worksheets to give Ben extra practice in whatever our math topic of the day was. Interestingly, as he worked through more and more problems, and became more skilled, he gained much more confidence. This confidence lead to more tolerance of math in general. I would love to say that it led to a new found love of math for him, but that would not only be stretching things, it would be a true miracle! Ben also really enjoyed the activities from the Making It Real book. The first activity he did was on the population of Australia. Since we had done a unit study on Australia last year (which he loved), he found doing these math activities interesting and fun. Whether you are looking for a complete curriculum for homeschooling, supplemental materials to fill in gaps, or material for homework help, Math Mammoth has something for you. It’s basic, no fluff, straight to the point math. It’s also very easy to use and cost-effective. Not sure where your student should begin with Math Mammoth? They offer FREE placement tests. You can also order FREE sample downloads. Items can be ordered individually or in sets. For example, you can get the entire Blue Series for $95 (that’s all of your math for grades 1-6!). Or you can purchase one grade for $34. If you just want some worksheets for Fractions, you can pick those up for under $7. Real Life Math is just $4.99. The TOS Crew tried all kinds of products from Math Mammoth. Be sure to click over to see what everyone else thought!